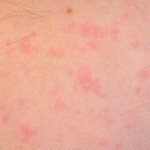 Hives are also known as urticaria, welts, wheals, or nettle rash. It is a red, raised, itchy skin rash that is sometimes triggered by something that produces an allergic reaction – an allergen. When there is an allergic reaction the body releases a protein called histamine. When histamine is released our capillaries (tiny blood vessels) leak fluid. The fluid accumulates in the skin and causes a rash. The wheals usually occur in batches, and frequently appear on the face or the extremities (arms, hands, fingers, legs, feet, and toes). Most cases a welt will disappear after a few hours, but are replaced by new ones. They can appear on just one part of the body, or several parts. In the majority of cases symptoms are present for no more than 8 to 12 hours, and rarely continue for more than 24 hours. However, with some patients the problems may continue for quite a few days, and even several months. 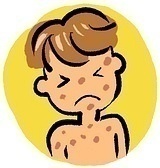 The most common cause of acute hives, particularly in children, is a viral infection. This may even be true if a child has not had any obvious recent illness. Acute hives can be related to other infections, such as, strep throat, athlete’s foot and urinary tract infection. Allergic reactions, particularly to foods and medications, are another common cause of acute hives. Generally speaking, hives that occur as a result of eating certain foods almost always appear within a few minutes to a few hours of eating the food. Reactions to medications may occur after the first dose, or not until the medication has been taken for a week or two. 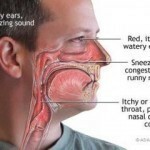 Stress is a common cause that acute and chronic hives share. You may not feel particularly stressed, but your body may, especially if you are very busy. 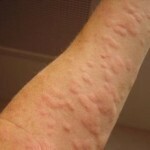 Life stressors that can result in hives may be positive or negative. Other than stress, the causes of chronic hives are quite different when compared to the causes of acute hives. Allergies only cause about 5 to 10% of chronic hives cases. When allergies cause chronic hives, pet allergy is usually to blame. Pollen, mold or dust mite allergies only rarely cause chronic hives. Chronic infections, such as viral hepatitis, sinus infections and urinary tract infections, can cause chronic hives. Some studies have shown that infection with helicobacter pylori, (bacteria) commonly connected with stomach ulcer is also associated with chronic hives. Metabolic diseases, such as low or high thyroid function, liver disease and kidney disease, may also be at the root of chronic hives. In addition, it appears that a large percentage of people without an obvious trigger for their chronic hives actually have an auto immune disease a condition in which the immune system attacks healthy tissue, including skin.